The violence during deportations is traumatizing. Those who flee or migrate often have to accept a life-threatening and expensive journey. Forced deprotations lead people back to the place from where they wanted or had to leave at all costs. Deprotations ignore a person‘sphysical and psychological integrity. People regularly die because of deportations. The authorities do not care about the threat of persecution, poverty or social isolation in countries of origin and simply accept the inhuman consequences of deportations. Physical and psychological integrity of all people have to be respected. All People have to be free to choose to return to a country or not. Special laws have been created to deport people. These laws do not count for Swiss people. According to these laws, rejected persons may be imprisoned for more than five and a half years without ever having committed a criminal act. The so-called administrative detention is not the only coercive measure. Rejected asylum seekers can also be forced not to leave territories (containment) or not to enter territories (exclusion). To order these measures, which deprive individuals of their liberty, hardly any court decisions are required. The authorities assessment is usually sufficient. In order to break the will of persons without residence permits and to make them leave Switzerland by themselves, they are demoralizedin the so-called emergency aid. The poor accomodation and the approx. 8 francs per day are too much to die and too little to live. Emergency aid is like mental torture and makes people ill. Administrative detention and emergency aid are degrading and inhumane. 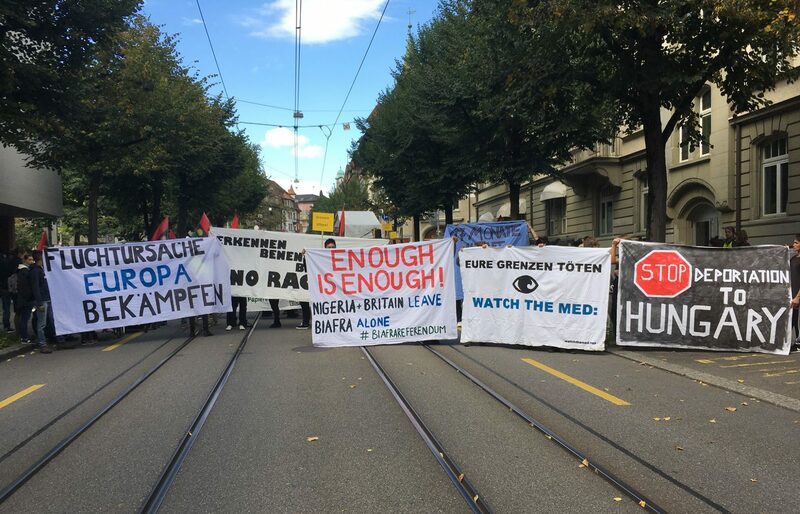 We want equal treatment for migrants without residence permits and swiss. We want equal access to labor, education, health, social assistance or a social life for all. A part of the population wants to deport rejected people at all costs. But not all states automatically accept deportations. This is why the authorities in Europe and Switzerland are trying to negotiate so-called readmission agreements or migration partnerships with states in the global South. In doing so, Switzerland benefits from its supremacy to put the governments of countries of origin under pressure. Whether with dictatorial regimes or democratic governments – the mechanism remains the same: the more a state accepts deportations, the higher the financial support, political recognition or economic incentives. On the other hand, Switzerland threatens to impose political or economic sanctions or reduce development contributions. Deportation deals are the result of a (post-) colonial and imperialist world order. No deals with the lives of persons from the global South. Fight the causes of flight and stop arms exports. Because of the Dublin Regulation, tens of thousands of migrants are pushed back and forth between European states every year. Switzerland is the European champion in this field. No other European state executes more Dublin deportations than Switzerland. On average, 54 refugees are deported and excluded from an asylum procedure in Switzerland every day. Switzerland hardly ever takes refugees from European border states. In the last three years, only 1500 asylum seekers from Italy and Greece have been admitted via the relocation programme. The worst deportation deal is the Dublin Regulation. Switzerland must cancel the Dublin Regulation. The authorities should use the sovereignty clause automatically.